Area : 5928 sq. km. Temperature : Max. 42°C and Min. 27°C in Summer. Max. 25°C and Min. 9°C in Winter. Rainfall : 60 cms to 95 cms. Jhalawar was created in 1838 A.D. after being separated from Kota by the British. Remarkable contributions from various rulers including Zalim Singh I made it a culturally rich state. Lying in the south-eastern region of Rajasthan at the edge of the Malwa plateau, Jhalawar has rocky but water-laden verdant landscape, unlike much of Rajasthan. With some exquisite pre-historic cave paintings, massive forts, thickly wooded forests, exotic wildlife variety and countless species of birds. 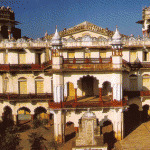 Jhalawar boasts of rich historic as well as natural wealth. The area is contributing a major share to the production of citrus fruit in the country. Air: Nearest airport is Kota 87 km. Rail: Nearest railhead is Kota, 85 km from Jhalawar, then by taxi or bus. Road: A good network of road connected from different part of the city. Jhalawar Fort: The impressive fort is located in the centre of the town. Some exquisite paintings and mirrors on the walls are of particular interest. Government Museum: One of the oldest museums of Rajasthan established in 1915 A.D., it has a fine collection of paintings, rare manuscripts, idols and beautiful statues. Bhawani Natya Shala: Close to the fort is the most unusual theatre in India. It was constructed in 1921 A.D. where Parsi theatre was performed initially. Gagron Fort: The impressive fort, built over 8th to 14th century A.D., stands witness to many great battles and is surrounded by the tranquil waters of the Ahu and Kali Sindh rivers on the three sides. 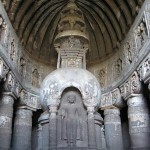 Buddhist Caves and Stupas: The ancient Buddhist caves located in the village Kolvi. A colossal figure of Buddha and the carved stupas are the most impressive structures in the caves. Rain Basera: Rain Basera is situated 6 km from Jhalawar. A picturesque wooden cottage on the banks of the Kishan Sagar Pond, it is an idyllic haunt for picnickers. Chandrabhaga Temple: Chandrabhaga Temple is situated 7 km from Jhalawar. On the banks of the magnificent Chandrabhaga River stand some splendid 7th century A.D. temples. The intricately carved pillars and arched gateways are fine examples of the temple architecture and craftsmanship. Bhimsagar: Bhimsagar is situated 24 km from Jhalawar.The dam built on the Ujad river is near the erstwhile capital of Khichi Chauhan rulers. 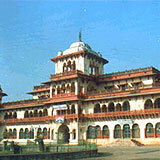 Bhimsagar allows a glimpse of the Rajput and Mughal architecture in the ruins of palaces, temples and mosques. Dalhanpur: Dalhanpur lies on the bank of river Chhapi, 54 km from Jhalawar in Rajasthan. The ancient ruins of impressive temple extend over an area of 2 km. Marvelously curved pillars, torans and exquisite sculptures make this temple interesting. Dense forest with lush foliage adds to the natural beauty of the spot. This entry was posted in Jhalawar, Rajasthan and tagged Bhawani Natya Shala, Bhimsagar, Buddhist Caves and Stupas, Chandrabhaga Temple, Dalhanpur, Gagron Fort, Government Museum, Jhalawar Fort, jhalawar india, Rain Basera, Suryamandir. Bookmark the permalink.